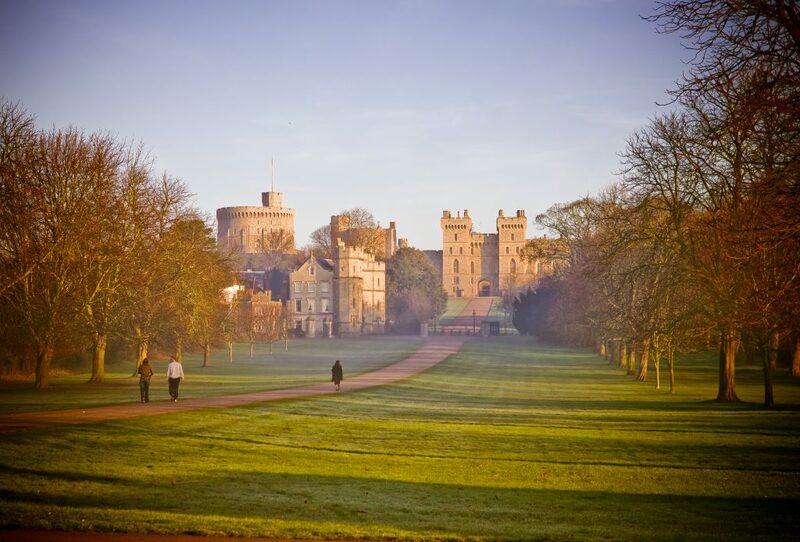 The straight path that links Windsor Castle with Snow Hill in Windsor Great Park is known as The Long Walk. 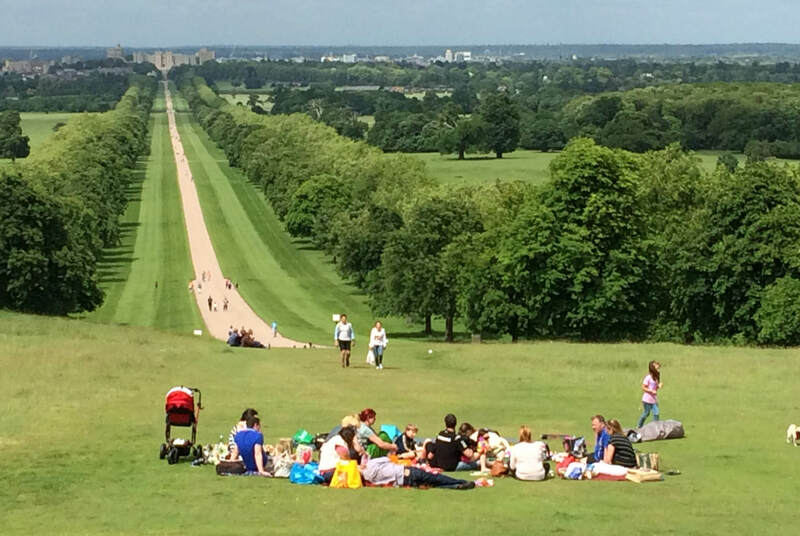 How long is the long walk in Windsor? From the Castle gate to the foot of the statue of King George III (The Copper Horse) The long walk measures 2.64 miles in length. So a run there and back is a great distance for joggers and is a very popular route for walkers too. Snow Hill, as the legend has it, was where King Henry VIII sat and waited for news of the execution of his second wife, Queen Anne Boleyn. 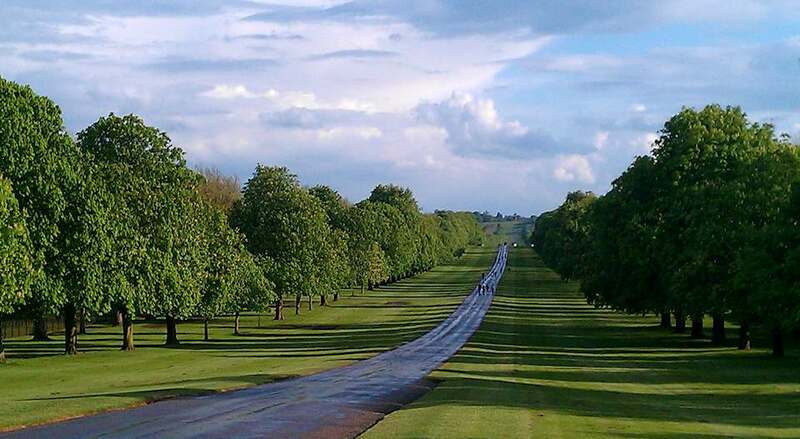 However, the path as we know it only came into being during the reign of King Charles II who had double rows of Elm trees planted the entire length of the route. There were 1,652 trees planted to create the basis of the landscape we know today. Charles had previously spent time at Versailles and wanted to remodel Windsor in a similar flamboyant style. The Long Walk was just one aspect of his improvement plans. Later in 1710 Queen Anne had a road constructed down the centre of the tree lined avenue so that coaches could head out into the park on a comfortably smooth surface. A little way down from the Castle, the Long Walk is crossed by the Albert Road (A308) to old Windsor. Cars often slow to a walking pace to enjoy the views in both directions. The Copper Horse statue is a huge installation and worth visiting in its own right. The view back toward the Castle is spectacular and you can see the Staines reservoirs, Harrow on the Hill, Wembley Stadium , Heathrow and the skyscrapers of London from this great vantage point. In summer this is a popular picnic spot. Snow Hill is a great picnic spot with glorious views along the long walk. The Long Walk is still used by the royal carriages every year as part of the route from Windsor Castle to the Ascot Races. Occasionally a warden’s car comes down Windsor’s Long Walk but other than that it is free from all except pedestrian traffic. Cycling is not permitted on any part of the Long Walk. Over the years Elms have been replaced by Oak, Horse Chestnut and London Plane trees. At the Park Street (Castle) end of the Long Walk Horse Chestnuts predominate, although these trees, which have provided conkers for generations of Windsor schoolboys succumbed to the bacterial canker outbreak of 2008 which meant the leaves went brown and dropped very early on. Although in 2009, the canker was still apparent, the trees looked much less affected and there were hopes of a reprieve. However, the following year they once again suffered. 2011 was dry and the blight was not so serious but there was still evidence of the disease. In the following few years the trees have not seen a marked deterioration and eight years later they are still standing proudly. Perhaps less well known is the fact that the Castle end of the Long Walk was notorious for the prostitutes who plied their trade there in the mid 1800s. 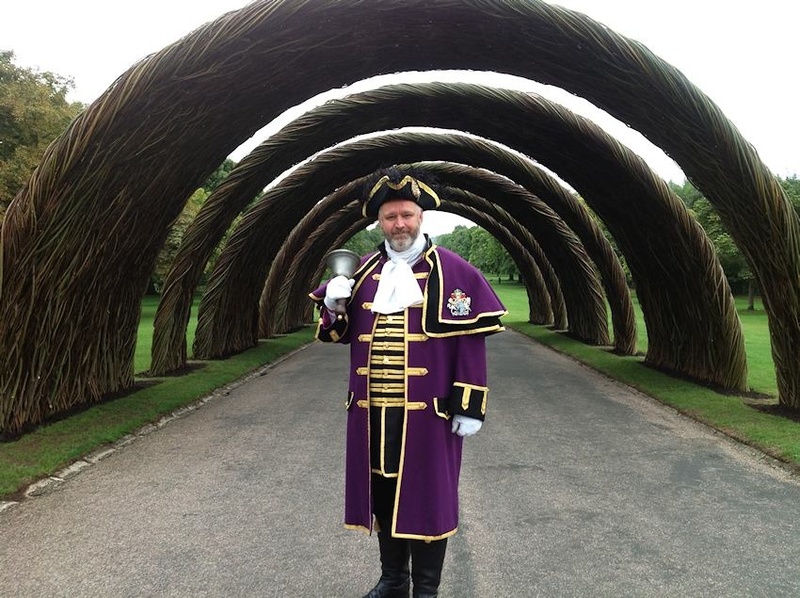 In 2013 six willow arches were temporarily installed at the Park street end of the walk to commemorate Queen Elizabeth’s six decades on the throne. The arches were removed after a few months, and the uninterrupted views from Castle to Snow Hill were restored. Each year on the Monarch’s birthday, the local council organises a 21 gun salute on the long walk to mark the occasion. The canon are miniature armaments, less than 2 foot long each, but nonetheless capable of producing a deafening blast. In 2016 Her majesty Queen Elizabeth came out onto the Long Walk to light the first of a chain of beacons that lit up the country as part of the Queen’s 90th Birthday celebrations. A few weeks later on Sunday 15th May 2016 a huge picnic and concert was held on the Long Walk, again as part of the Queen’s Birthday celebrations. 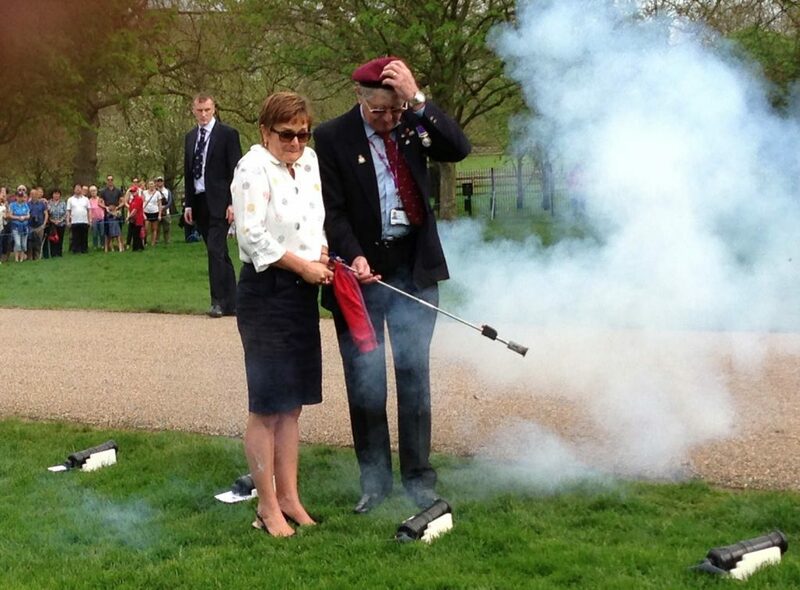 There is a small but loud annual ceremony on the monarch’s birthday when the local council fire off a set of 21 minature cannon in salute. On 19th May 2018 The Long Walk was once more packed with onlookers as Prince Harry and Meghan Markle came by in a horse and carriage on their wedding day. This was almost certainly the largest crowd ever to gather on the Long Walk.